A genuine 5mm round London blue topaz gemstone is the centerpiece of this beautiful, hand-crafted vintage-style heart ring made in solid 14k white gold. Own a piece of jewelry history with this genuine London Blue Topaz vintage ring made using authentic circa 1800s period jewelry-making tools and ring hubs from the era. Set with 2 white round diamonds, one on each side, in quality H-I Color, SI Clarity, weighing 0.04 carats total diamond weight. Also available in sterling silver (shown below) or purchase it in 14k or 18k white gold (please allow 1 additional week for 18k). 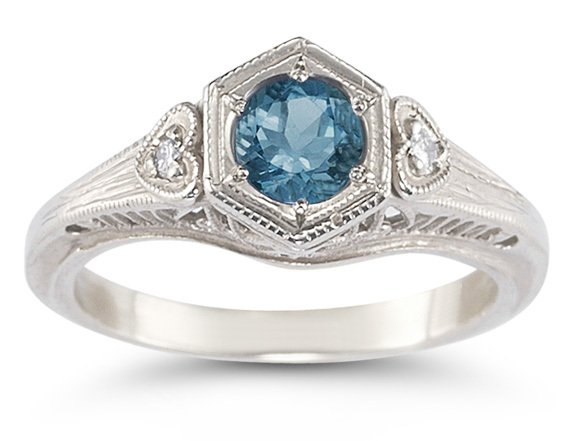 We guarantee our London Blue Topaz Vintage Heart Ring to be high quality, authentic jewelry, as described above.